Team support can have a huge impact, and whether coming from the fans in the stands or from fellow team members, girls softball cheers can provide energy and enthusiasm to keep spirits high and win the game. We're here to win one more! (Player's Name) - you're gonna drive that ball! (Player's Name) - c'mon -- give it your all! Fans on the bleachers can help encourage the girls softball team by calling out encouragement, chants, cheers or sayings. Parents and supporters as well as the team should show good sportsmanship by keeping the cheers focused on encouraging their team rather than negatory cheers about the other softball team. Cheering is perfect when someone on the softball team scores, makes a great play, catches a fly ball or has a great hit. Encouragement cheering for walks, foul balls and close plays can also keep the team's energy up to make a great finish. Whether the team is in the dugout or on the field, providing mutual support for players is important. Players should make an effort to cheer for every member of the team and not just the star players. Aspects like good teamwork in the field and backing up the pitcher are important elements of the game, even if they aren't noticed as much as scoring runs. A mutually supportive softball team is important at any level, but especially for younger players. 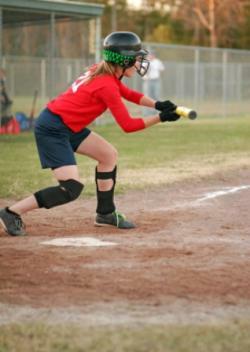 Youth softball players can get really down on themselves for making mistakes and feel discouraged and frustrated. They may get overly disappointed in themselves and feel like they are letting the whole team down. While recognizing fielding errors and ways to improve their batting and pitching can help girls improve their skills for the future, focusing too much on the missed play or the fact that they stuck out may keep some girls from excelling. Parents, coaches, and the team itself can all play a part in keeping a positive and encouraging environment, and keep it fun! In addition to girls softball cheers, there are many other ways to bring spirit to game day. The team can wear matching warm ups to school on game days and give each other support with notes, posters or small items like a bottle of Gatorade or packs of gum. Parents and supporters can make signs, wave banners and use other spirit items to show visual support.